Starting with Dynamics 365 for Customer Engagement apps version 9.0 you can send data about events that occur on the server to a web application using webhooks. Webhooks is a lightweight HTTP pattern for connecting Web APIs and services with a publish/subscribe model. Webhook senders notify receivers about events by making requests to receiver endpoints with some information about the events. Azure Service Bus works for high scale processing, and provides a full queueing mechanism if Dynamics 365 is pushing many events. This topic will start by explaining how to register a webhook and how to test the registration using a request logging site. This information will help inform you about the requirements in creating and configuring a service designed to consume webhook requests which is explained in Create or Configure a service to consume webhook requests. Use the Plug-in Registration tool to register a webhook. To get the Plug-in registration tool, see Download tools from NuGet. 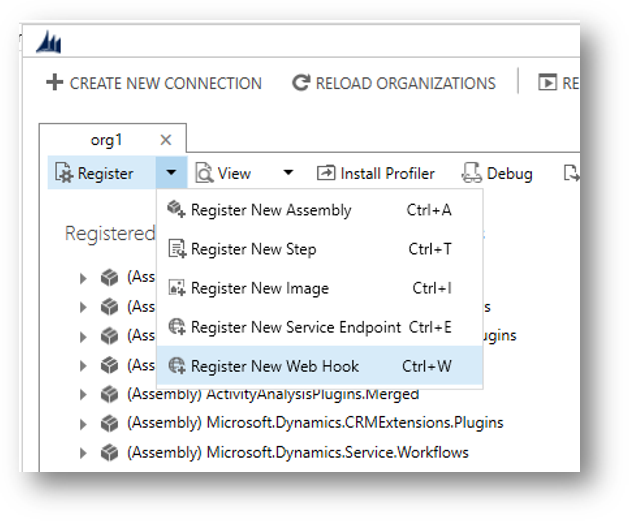 In the Plug-in Registration tool there is a new Register New Web Hook option to select. Name A unique name describing the web hook. Endpoint URL The URL to post execution context information to. Authentication One of three authentication options. For any type of authentication, you must provide the keys that will identify the request as legitimate. HttpHeader Includes one or more key values pairs in the header of the http request. WebhookKey Includes a query string using code as the key and a value required by the endpoint. When registering the web hook using the Plug-in Registration tool, only enter the value. HttpQueryString Includes one or more key value pairs as query string parameters. The WebhookKey option is useful with Azure Functions because the authentication query string is expected to have a key name of code. Any request to the endpoint configured should fail when the authentication options passed in the request do not match. This is the responsibility of the endpoint. Webhook registrations are stored in the ServiceEndpoint Entity and have a Contract value of 8. 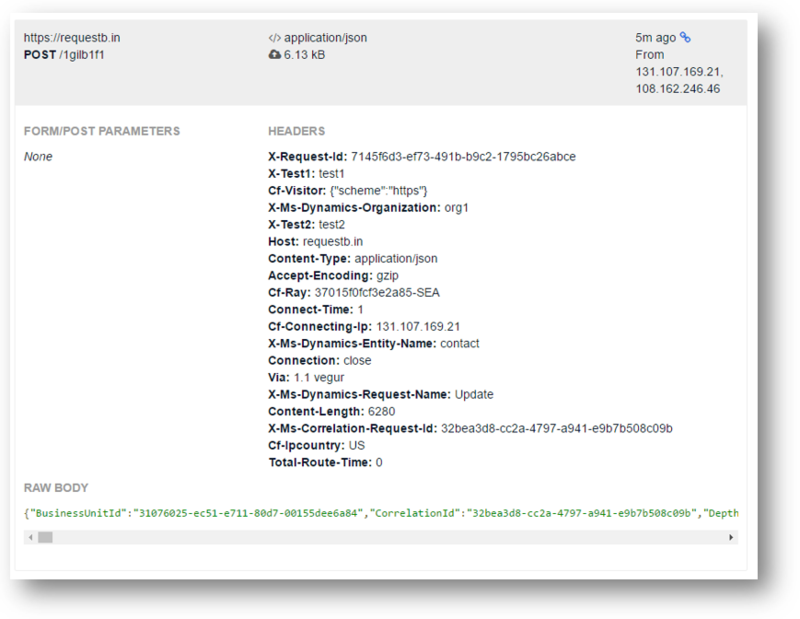 You can find details about the registered webhooks by querying the ServiceEndpoint entity. Details about the authentication values set are in the AuthValue property and cannot be retrieved. Registering a step for a webhook is like registering a step for a plugin. The main difference is that you cannot specify any configuration information. Just like a plugin, you specify the message, and information about entities when appropriate. You can also specify where in the event pipeline to execute the web hook, the execution mode and whether to delete any AsyncOperation when the operation succeeds. Information about the Step Name, and Description will be auto-populated based on the options you choose, but you can change them. If you do not set some Filtering Attributes for a message that supports them, you will be prompted to do so as a performance best practices. Your choice in registering the webhook changes the experience you will have when debugging if things don’t work. When you use asynchronous execution mode an asyncoperation job will be created to capture the success or failure of the operation. Choosing to delete the asyncoperation when it succeeds will save you database space. Any errors that occur will be recorded in System Jobs. In the web application you can go to Settings > System > System Jobs to review the status of any web hooks. There will be a Status Reason value of Failed. Open the failed system job entity to find details that describe why the job failed. You should use synchronous mode when it is important that the operation triggered by the webhook occur immediately or if you want the entire transaction to fail unless the webhook payload is recieved by the service. A simple webhook step registration provides limited options to manage failure, but you can also invoke webhooks using plugins workflow activities if you require more control. More information: Invoke a webhook from a plugin or workflow activity. See Query failed asynchronous jobs for a given step for information about how to retrieve data about failed asynchronous jobs. Data for registered webhooks is in the SdkMessageProcessingStep Entity. You can query the steps registered for a specific webhook when you know the serviceendpointid for the webhook. See Query webhook registrations for a query to get the id for a registered web hook. When you know the sdkmessageprocessingstepid of a given step, you can query the AsynchronousOperations Entity for any errors. You can use the OwningExtensionId value to filter the results to a specific registered step. The following examples use <stepid> for the sdkmessageprocessingstepid of the step. Go to https://requestb.in/ and click Create a RequestBin. The next page will provide a Bin URL like : https://requestb.in/<random string>. Copy this URL. Refresh the page and the page URL will change to https://requestb.in/<random string>?inspect and will show that no requests have been made to the URL. Use the plugin registration tool to register a new webhook as described under Register a webhook. Use the URL you copied in step 2 as the Endpoint URL. Set a name and any authentication properties you want. Request Bin will not evaluate these values in the way that an actual site that will process the data should, but you can see how they will be passed through. Use the plugin registration tool to register a step using the webhook you created in step 4 as described in Register a step for a webhook. Make sure to use an event that you can easily perform by editing data in the Dynamics 365 application, such as updating a contact entity. Use the Dynamics 365 app to perform the operation to trigger the event. Webhooks is simply a pattern that can be applied using a wide range of technologies. There are no required frameworks, platforms, or programming languages you must use. Use the skills and knowledge you have to deliver the appropriate solution. Azure Functions provide an excellent way to deliver a solution using webhooks, but it is not a requirement. This section will not provide guidance towards a specific solution but will instead describe the data that will be passed to your service that will enable your service to add value. As demonstrated in Test your registration with a request logging site, you can register a test webhook step and use the request logging site to capture the specific kinds of data that your application can process. In this example, the contact's first name was changed from 'Jim' to 'James'.